I would like to share with you an example of a commissioned oil painting that I completed this week. 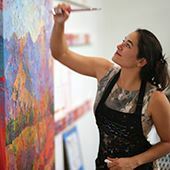 The more you know about the commission process, the easier it is to work with the artist to create the perfect painting. This is an example of creating the ideal painting to suit a room that has already been decorated. 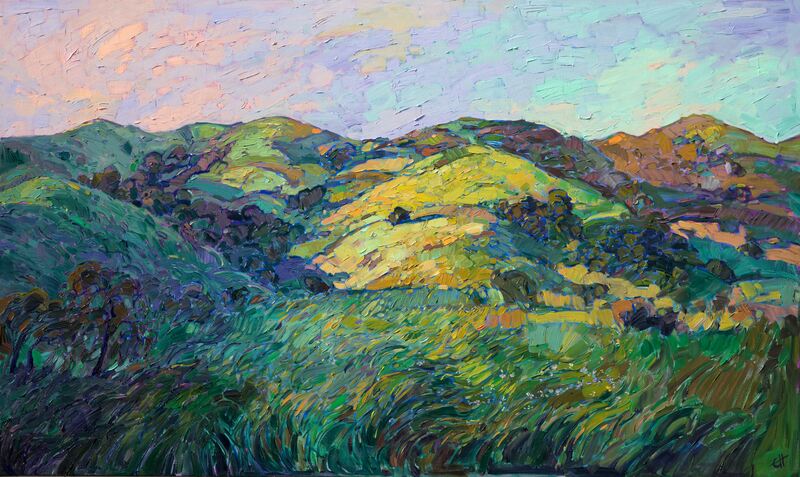 A custom oil painting should pull together all the colors in the room and create a focal point for the space. 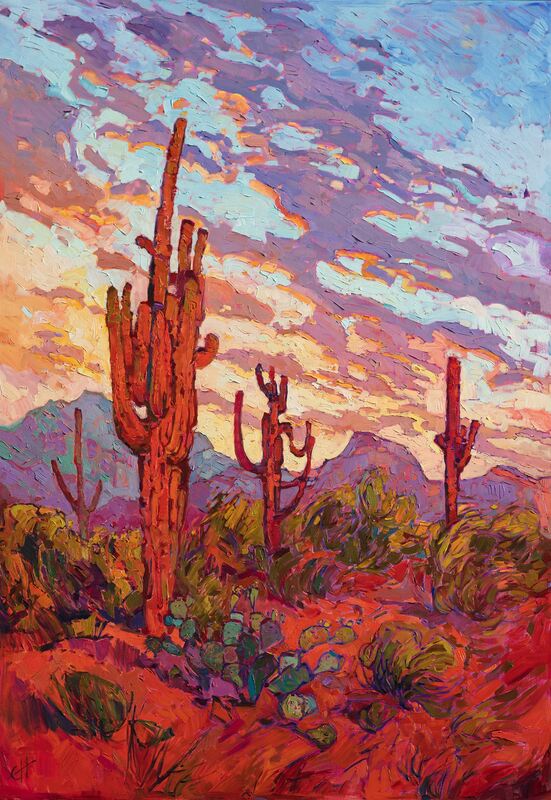 I will use this painting of "Saguaro Sunset" in this blog article to illustrate the commission process for you. 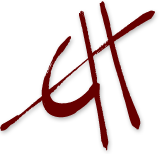 The first step is to go through my book or my portfolio and select your favorite paintings. Choose pieces that you think would look great in your room, in terms of color and subject matter. 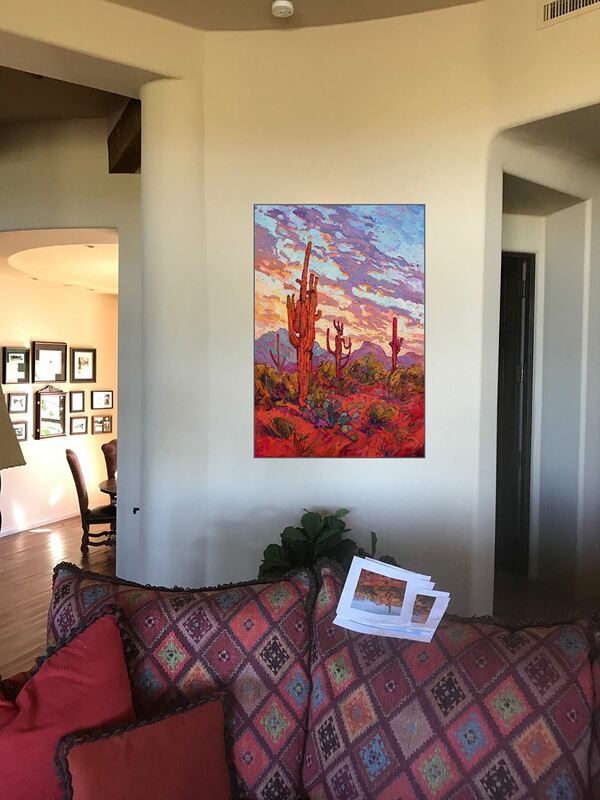 Let me know what draws you to these paintings, and let me know any elements that you would like to see represented in your painting, such as "dramatic clouds," "crystalline light coming through the trees," "silhouetted trees," etc. 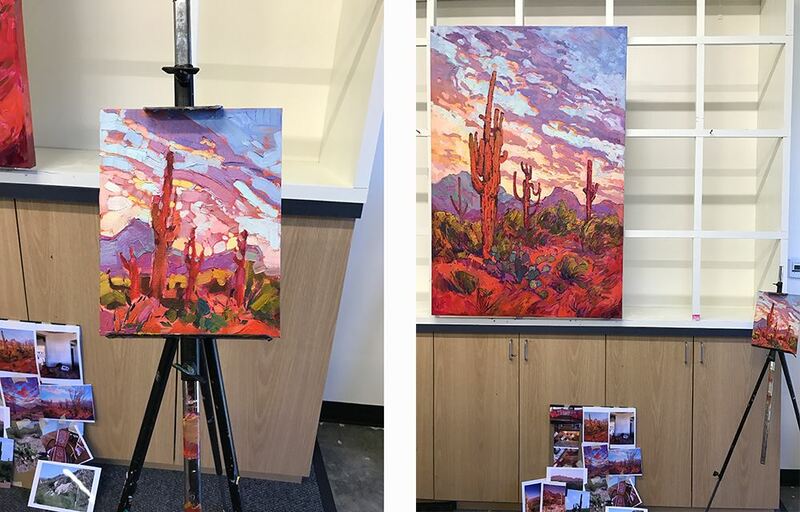 In this example commission, my collector chose these three paintings below that most closely captured the color and subject matter she wanted for her home in Scottsdale, AZ. She also let me know that her favorite cacti were saguaro and prickly pear. 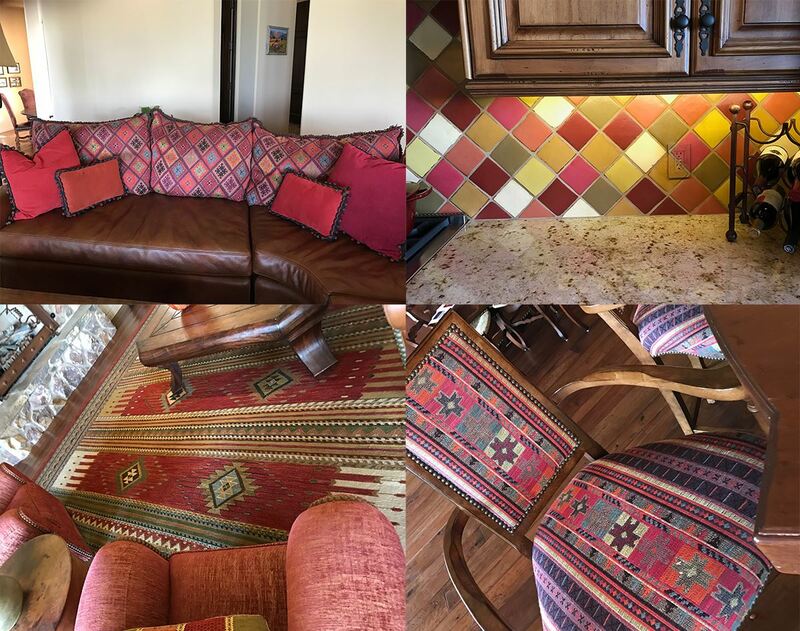 The next step is to send me photos of your room, including pictures of any fabrics, rugs, and accents in the room. I will use these references to create my color palette for the painting. 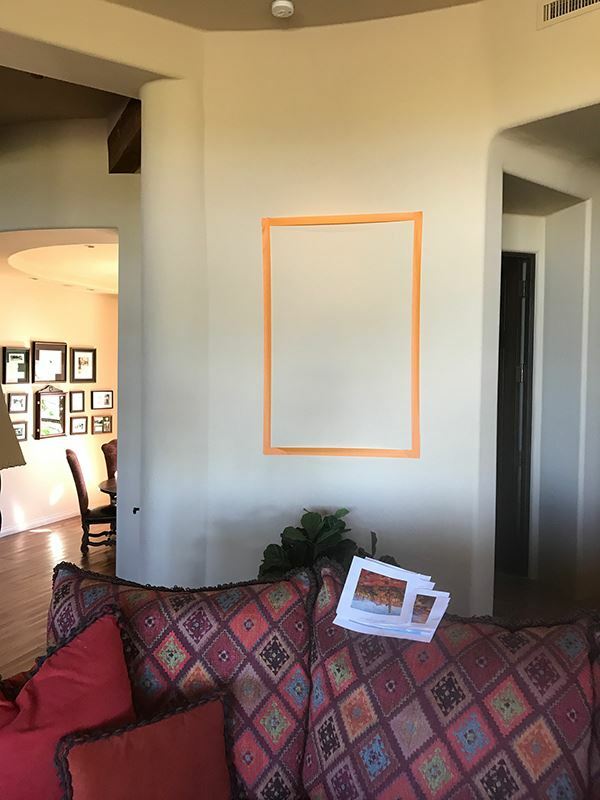 It is helpful to mark out the size of the painting you want onto the wall, using blue masking tape. Take a look at the wall from different angles around the house, to make sure the size is correct. All my canvases are custom made for me, so I can create any size you need. This is a good time to decide if you would like a frame for your painting, since the frame will add to the width of the piece. The best size for this space was 38.5" wide x 57" tall, unframed. Now I have everything I need to begin painting. I start by mixing my colors based on my reference photos, and I create an original composition based on photos I have taken out in the field. 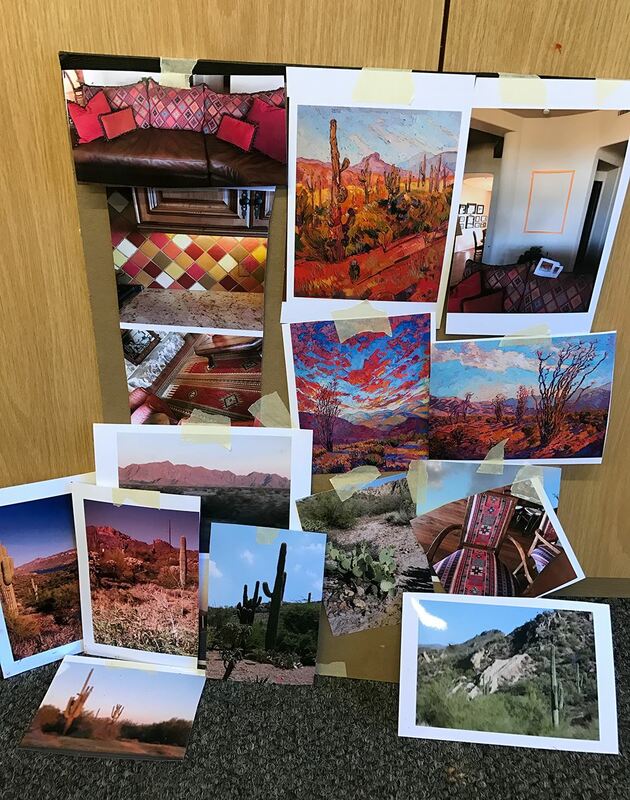 In this example, I printed out photos I have taken of saguaros and prickly pear cacti, as well as some dramatic sunsets and distant mountains. Here I dropped the painting into the room using Photoshop, again to make sure the colors are correct. I wanted to be sure I incorporated both the warm orange-red and cool pink-reds in the throw pillows. I brought in some of the yellows and greens from the kitchen tile backsplash. The soft blues and purples tie in with the fabric on the sofa and chairs. Now my collector has a painting that she will be able to enjoy for many years to come!